Ah, the duffel bag. Who doesn’t love a good duffel bag? They are strong, durable, long-lasting, and able to carry anything you may need. Whether you need to carry a computer, your bathing suit and flip flops or your sweaty gym clothes, duffel bags are great on-the-go solutions. In the bag world, there seems to be no bag better than the duffel bag. But please don’t be fooled. There is one that trumps a regular duffel bag. Behold customized duffel bags! Custom duffel bags are an excellent option for any business looking to increase their brand recognition, increase company visibility outside of the office and engage in free advertising. Adding your company’s unique logo to a high-quality custom duffel bag allows for your brand to be seen around the world. 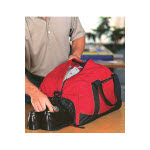 Southern Advertising has a variety of options to customize duffel bags with no minimum. Here are our Top 5 Places A Custom Duffel Bag is Better Than A Regular One. 1. The Gym - It is well known that healthy and happy employees are more productive, miss less days of work, and are essential to a well-functioning business. If you are a company that promotes health and wellness, consider a custom duffel bag to be used at the gym. These customized duffel bags donning your company’s logo make excellent gifts for high performing employees, special clients, and family members. 2. Sports Teams - “Work hard, play hard”- A great motto to live by. Many companies either have their own social sports teams or sponsor other local teams. Custom duffel bags help create unity within the team and allow your brand to be seen by countless members of the community. 3. Travel - Have you ever been at airport baggage claim and accidentally picked up someone else’s bag or had another person accidentally take your bag because they were essentially identical? Well, carrying a custom duffel bag is both the solution to this problem and one of the best ways to increase brand recognition well beyond your geographical location. 4. Conventions and Seminars - The next time your business participates in a convention, seminar, or networking event, think about handing out high-quality, customized duffel bags. Those that receive them are likely to use them again in the future and will see your logo repeatedly. 5. Business Meetings - No matter what it is you need in order to be successful at your next business meeting, a customized duffel bag is your go-to choice. Designed to hold anything from files to computers, they are designed to keep you organized, professional, and prepared. Customized duffel bags are an excellent and affordable way to increase brand recognition. There are many color options and designs to choose from and you approve all artwork before production begins.